The Friday evening social will be held at the High Plains Shelter in the midst of beautiful Miami Whitewater Forest’s nearly 5,000 acres. At 6:30 p.m. we will start off with a barbeque dinner. We will have an up close visit from an owl and great conversation until 9 p.m. From 9 till 10 we’ll go for a night walk through a mature forest to wrap up the festivities. 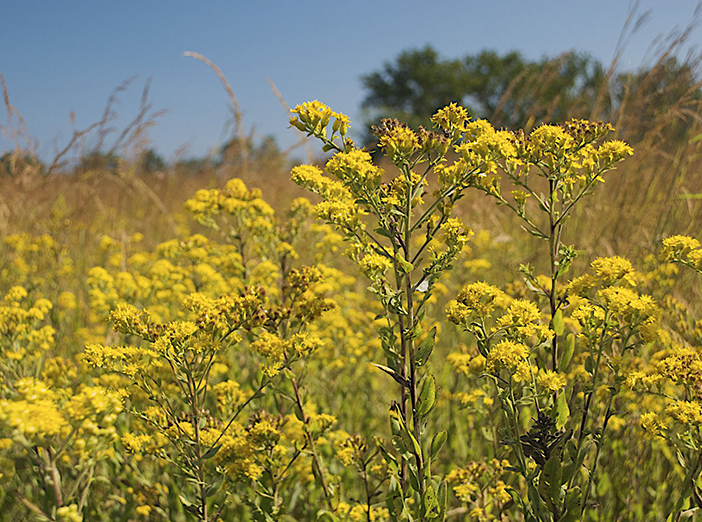 On Saturday we will start off the day with coffee, tea and a snack, a welcome and introduction to the ecology of Southwest Ohio then a fascinating presentation by Dr. David Lenz about the Ethnobotany of Ohio Prairie Plants. Around mid -morning we will car pool 6 miles to Fernald Preserve for a presentation and easy walk to learn about this 1,000 acre restored and created prairie and wetland site. Once a U.S. Department of Energy industrial complex, it is now a bird watching hot spot and important wildlife habitat. We will return to Miami Whitewater Forest for lunch, followed by a hayride into the prairie. We’ll load onto hay wagons or a van for an 8 mile trip through the 500 acre Shaker Trace prairie and wetland complex. We will stop several times for short walks to view blooming beauties and learn more about the botany and innovative management of prairies by several experts. Topics will include rare species, controlling invasive plants, burning, and a tour of our 40 acre prairie nursery. We will return to our cars by 4:30 p.m.